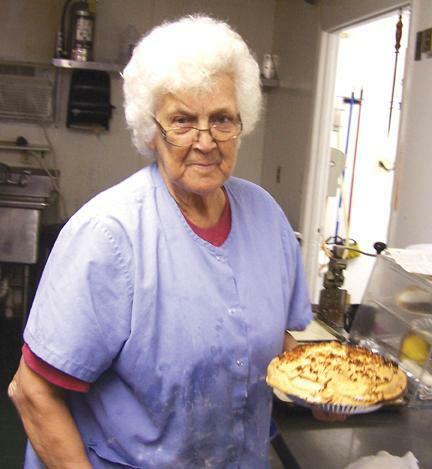 At 84, Ovie Hollis still works daily at Joe's Place on the courthouse square in Woodbury, baking the meringue-topped cream pies and light, fluffy biscuits she has become justly famous for. Most people don't start a whole new career at 64, but that's just what Ovie did. "I worked 30 years at General Electric, then I retired," she said. She stayed home for a year and decided, "I did not like retirement, so I worked a couple of little jobs and then they needed a cook here and hired me." That was the beginning of her new career at Joe's Place, where she started making biscuits right away and soon, pie-baking was added to her duties. "Grandma Knox taught me to cook," she said. "Mama always had too many babies." Ovie was the second child of 13 born to Dowel and Lois Rogers. "Mama got married when she was 16, had her first baby when she was 18, and her second when she was 19. That was me," Ovie said with a grin. "I was raised over by Readyville down behind the hill where the cell tower is now," she added. "Of course, we had no phones back then. Daddy would walk up the hill and tell us if the river was out." Her parents started out in a two-room cabin and had six children before they moved to larger quarters. "When Granddaddy got sick, we moved in with Granddaddy. I thought I was in Heaven," Ovie said with a chuckle. "We had three rooms and a front porch and a back porch, then Daddy added onto it. We had a big old house." She started working for her uncle in 1944 doing his family's laundry. "Me and my oldest sister walked to my uncle's every Monday and washed," she said. "Back then, you put it in a black washpot and boiled it, out by the pump." The next summer, the two girls worked tending patients at the old Central State Mental Hospital near Genesco. "We made $30 a month," Ovie said. "We washed them, fed them, took them to the dining room or the bathroom. We were a little young for that, I guess, but it was what we did." Like most other country children of her generation, Ovie also remembers helping with plowing and planting on her parents' farm. "I'll never forget," she said. "Daddy had his arm broken, so my brother and I plowed. That was in 1945 or '6. I married in 1947." She was only two years older at her own wedding than her mother had been as a bride, but she recalled, "I thought I was madly in love with Nile Hollis. But I can't complain. We were married 18 years. He died young; I never remarried. I had three children to raise." So Ovie worked for G.E., raising her children, a granddaughter, and eventually a great-granddaughter. And at 64, she started cooking for pay. She worked from 2 a.m. until 10 a.m. at first, baking biscuits by the hundreds for folks who passed through Woodbury on their way to work in McMinnville. "The most biscuits I ever cooked in one morning was 600, but we made 450 to 500 every day then. I know it was 600 because five pounds of flour will make 60 biscuits, and that day we used 50 pounds of flour," she explained while nibbling on one of her own biscuits still hot from the oven in Joe's Place. Ovie said she was "eating a wad." The wad is the last piece of dough that she always balls up and cooks for herself: "I don't throw nothing away." After Ovie had been cooking and baking biscuits for a couple of years, the other cook who worked at Joe's quit. So Ovie started learning to bake pies, and a legend was born. "When I started doing pies, I tried recipes until I got what I thought was good," she said. "Cooking is a gift. You have to have the gift." And if her pies and biscuits are any measure, Ovie surely has that gift. She added that when she can't sleep or gets unhappy, she just goes out in her kitchen and starts cooking something. "If I can't sleep, I get up in the night and get out that cookbook and read 'til I find something I like and start cooking," she said. "When it's done, I go back to bed and eat it the next day." She also fondly recalls special meals her grandma made when Ovie was a child. "She always boiled a hambone until all the meat fell off and she made us corn-meal dumplings. She'd get a little old spoonful and make a little ball, then drop them in the broth. We called 'em hambone dumplings. You can't cook on electric like she did on that old woodstove," Ovie said. "I'm going to make me some, one of these days." And when she does, let's hope Joe's Place puts hambone dumplings on the menu so everybody can try them. This is not only an article about a fine subject ( No better person than Ovie!!! ), but exceptionally well-written. We need MORE articles by this writer in the COURIER!